Explain the law of negatively sloped demand curve. Qdx =8 - Px cet.par. 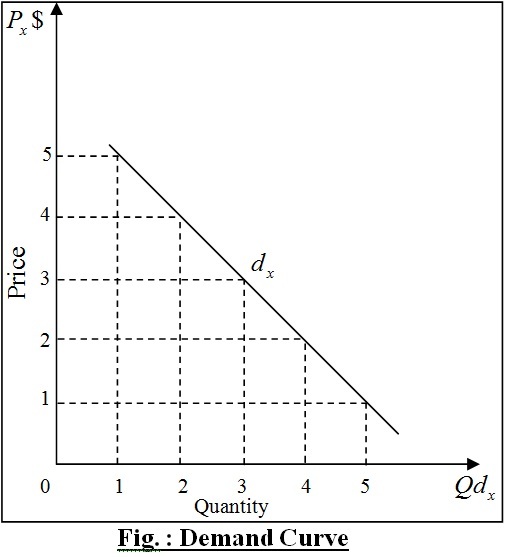 Here, Qdx is the quantity demanded and Px is the price of X commodity. Now obtain the demand curve; we will plot each pair of values from the demand schedule on a graph. In that given graph figure, we have plotted all the pairs of value from the above given demand schedule. 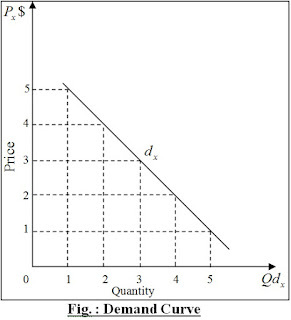 We have plotted various prices on the vertical axes and quantity demanded on the horizontal axes. dx is the required demand curve. From that graph, it is seen to us that when the price is high, the quantity demanded is low. Again, when the price is low the demand is high. That is the price and demand has a inverse relation. That can be indicated, such as, when the price is 5$ the demand is 1 unit, when the price is 4$ the demand is 2 unit etc. That’s how the demand increases with the decrease in price. That’s way we also can say the demand curve is negatively sloped. Because, at a high price of a commodity less of it is purchased and at a low price of a commodity more of it is purchased. Thus the demand curve is always downward. This is usually referred to as the Law of Negatively Sloped Demand Curve.